INDIANAPOLIS – I turned on an NHL preseason on Tuesday night and saw advertisements in the corners. This wasn’t a shock to me as it was announced that the NHL would be giving teams the ability to place advertisements in each corner of the ice during the 2018-19 season. That said, so many people on social media were talking up a storm about how bad it looks and how big of a mistake the NHL made by allowing teams to put more ads on the ice. For as long as I can remember, minor league hockey uniforms have featured advertisements. Whether it is a small sticker across the top of the helmet, a shoulder patch on the jersey or a patch underneath the name and number on the back of the jersey. That said, people continue to freak out when the topic of logos on NHL uniforms. My question, what’s the difference? The biggest argument from is the uniforms are “sacred,” adding a company logo can ruin that for fans. Most hockey fans will go to a minor league game in their local city to watch professional hockey. Those jerseys have logos on them and a lot of the time, they’re wearing alternate or specialty jerseys. How much of a difference does that have to an NHL team having an advertisement on their helmet or as a shoulder patch? An ad on the uniform of a team can mean a significant amount of revenue. According to ESPN, the NBA’s Golden State Warriors are receiving $20 million per year for three years for the Rakuten ad on the upper left chest of their jerseys. The NBA began using advertisements on their uniforms this past season as well as the NHL using ads on uniforms during the World Cup of Hockey. Obviously, the difference in ad revenue between an NBA team and an ECHL team is significant, but that doesn’t mean a company putting their logo on the helmet of the local team doesn’t give teams a small amount of revenue for travel, arena costs, etc. Not only are ads on uniforms a big talking point, but in-arena advertising is a massive area of interest for the NHL this season, as for the first time, the league will allow teams to put on-ice advertisements in the corners of each rink. If you’ve ever watched a European hockey game, or the Fort Wayne Komets for that matter, the rink is COVERED with advertisements. When I say covered, I mean, covered. 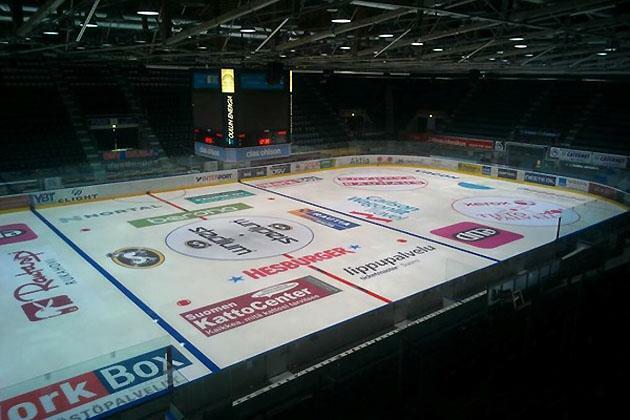 Do I think this will ever happen to a North American rink? No, it’s too much (unless you’re the Komets). The average rink has the ads in the neutral zone and maybe a couple along the blue line or in the faceoff circles. The Indy Fuel have both, but it’s not distracting if you’re watching the game, it’s almost normal at this point. Honestly, I’d rather have the logos along the blue lines in NHL rinks but that’s usually saved for their own advertising during the playoffs and at the beginning of the season. An ad in the corners will go unnoticed a majority of the time. 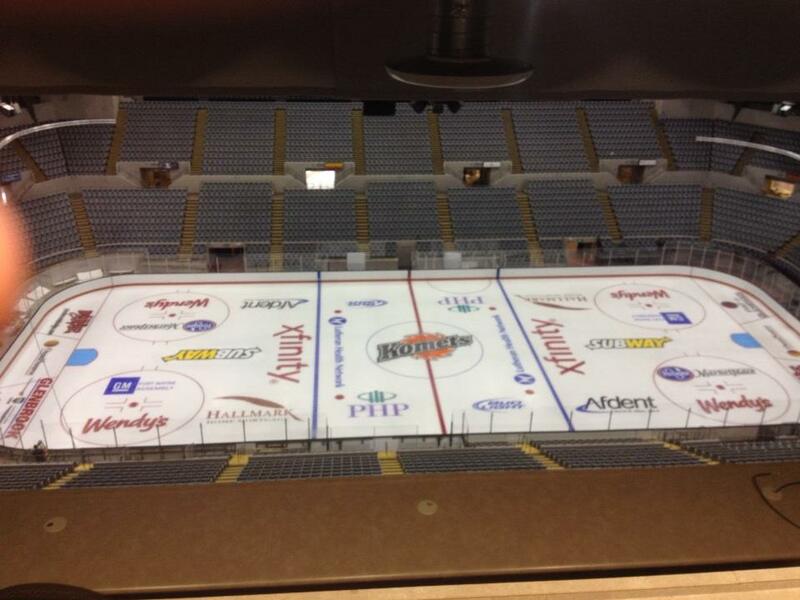 It’s just hidden enough but still will give some exposure to the companies that purchase those on-ice locations. The minor leagues should be the ones to set the bar for leagues to bring advertising into their everyday lives. If an ad works in the corners in a minor league hockey game and fans rarely say anything about it, give it a shot in the big leagues. That being said, don’t go overboard. The last thing we need is the NHL looking like the Finnish Liiga. 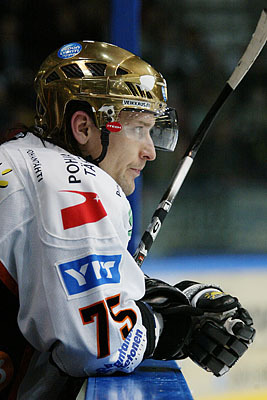 Although, it would be cool to have the top player on every team wear a gold helmet for a game. Regardless, it’s only a matter of time before we see the shoulder ads on NHL uniforms or an ad on each side of the helmet. It’s subtle but gets the job done. And once they’ve been worn for 10-15 games, fans aren’t going to know the difference. The minor leagues have been dealing with advertisements on uniforms and the ice for many years, it’s only a matter of time before we see it in every NHL game.